Few things make as much lead generation sense for sales people as public speaking. Your prospects get to see you and hear you sharing expertise without any risk on their part. Speeches are a perfect opportunity to be seen, heard, and most important, remembered. Sure, sales people like to talk. But let's acknowledge a universal truth. 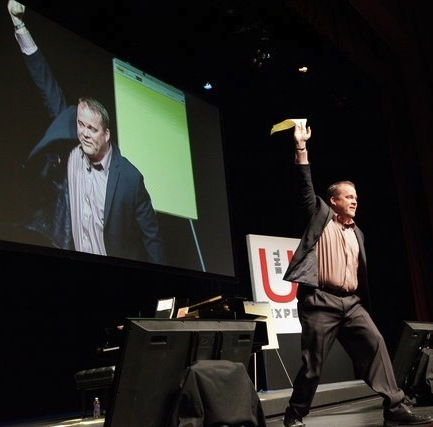 Nobody -- even sales people -- likes public speaking. At least, not at first. Standing in front of a group of strangers can be nerve-wracking. Luckily, there's a cure, and it's simple: practice, practice, practice. 1. Prepare your credentials. Securing speaking engagements is not as easy as throwing your name into a hat. You have to prove yourself and your credentials: A strong business track record, a unique message worth hearing and compelling speaking skills. 2. Join Toastmasters International. If you need to learn how to speak, join Toastmasters. Since 1924, this international association has not only attracted other success-oriented professionals (translation: prospects), it's also a great, low-threat way to pick up practical pointers, watch other dynamic speakers in action, and begin to get used to the idea of speaking to groups. 3. Fish in local waters. To find places to speak, start with family, friends and fools you work with. Just ask. As with other things in life, our circle of influence is often more connected to what we want than we might realize. Want to talk to local hiring managers at technology firms? Ask around and you might be surprised how many people in your network can suggest groups you might approach that need speakers. 4. Package yourself. Write a one-page letter that explains who you are, what your background is, and three to five topics on which you are prepared to speak. Make this your standard "speech pitch." Also make sure you have a one-paragraph biography, introductory paragraphs for each speech, and a pre-written introduction (to YOU) available for the people who book you. 5. Advertise your expertise. Prepare a 30-second commercial for your speaking. Condense what you have to offer to an audience as much as possible: "I'm Joann Blough, and I'm an expert on tax savings. I speak to more than 20 groups a year on unique tax strategies, leveraging international tax law and expanding tax savings through an international approach." Use this "elevator speech" when you network and socialize. 6. Get connected. Buy a copy of a local directory of clubs and organizations. Most major cities have directories of active groups that use speakers. This kind of directory can be an invaluable resource when you're sending out letters offering your speaking services. 7. Ask. Contact group staff and committee members, who can tell you about each group's procedures for selecting speakers. 8. Go to college. Contact university continuing education instructors in your field and offer to be a guest lecturer. Be sure to use handouts that are printed on your stationery that includes your phone number and web address. Extended-studies students are often more motivated, better educated and more attuned to forming alliances than the average person in the industry. 9. Go pro. Get paid to speak -- as a university extension instructor, or with such organizations as The Learning Annex. 10. Go corporate. Offer to do in-house training for corporations. It's a low-pressure way to hone your skills and really dig deeply into your subject of expertise. As you progress, you'll also discover the need to make your speaking more interesting and animated when you're working with a group for a longer period of time -- good lessons for anybody who wants to spend more time at the podium generating leads.